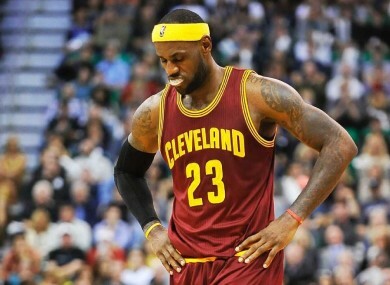 THE CLEVELAND CAVALIERS fell to 1-3 last night, losing to the Utah Jazz 102-100 on a buzzer beater by Gordon Hayward. He scored 31 points on 18 shots and played 42 minutes. He even appeared to wave off Shawn Marion when he tried to sub in for him with two minutes left in the third quarter. The Cavs looked dead with 13 seconds left, but LeBron single-handedly brought them back. After the game, LeBron criticised teammate Tristan Thompson for not getting close enough to Hayward, saying, "Tristan laid off a little too much." Email “LeBron James single-handedly ties game with 6 points in 10 seconds, loses on buzzer beater”. Feedback on “LeBron James single-handedly ties game with 6 points in 10 seconds, loses on buzzer beater”.